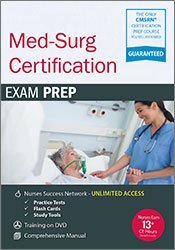 Pass the Med Surg Certification Exam…The First Time! Preparation for the exam has just become easier and more effective. With this program we will cover all the major topic areas included in the Medical-Surgical Nursing Certification Board and the American Nurses Credentialing Center Medical-Surgical certification exams. With and in-depth review of systems and a refresher on current practices, you will be prepared for success…by not just reviewing key concepts, but also reinforcing them through realistic test questions! You’ll also gain valuable test-taking strategies and tips that will aid in your quest to become a certified Med-Surg nurse. Join expert and national speaker Cyndi Zarbano, MSN, BSN, CCRN, CEN, PCCN, CMSRN, CLNC, for this comprehensive program that includes a powerful practice exam and unlimited access to all online resources. You can finally achieve your dream on becoming certified – the first time you take the exam! Consider the differences between the ANCC and the MSNCB exams and determine which will best suit current practice. Evaluate the anatomy and physiology of common disorders for each body system. Apply treatment modalities and nursing interventions to include outcomes and evaluation criteria of common disorders of each body system. Specify the normal values for commonly ordered labs. Determine the underlying etiologies of disruptions in physiologic homeostasis. Analyze key components of a comprehensive review of systems, including diagnosis and rationale for treatment. Point out the most common medications ordered by disease process. Substantiate legal and ethical implications of professional nursing issues and concerns. Anticipate the needs of special populations during acute illness. Develop a study plan for the exam based on understanding the blueprint and domains of practice covered. Anticipate pearls and pitfalls in both preparing for and taking the medical surgical nurse certification exam. Cyndi Zarbano is an intensive care nurse with over 20 years of nursing experience who is currently practicing in the Twin Cities area of Minnesota. She is a nationally-recognized seminar speaker who has opened multiple national symposiums and speaks on several topics for PESI, as well as a variety of other companies in the US and Canada. In addition to her speaking engagements, Cyndi is the author of the Clinical Nursing Assessment Skills Pocket Guide (PESI, 2013). Her products also include textbooks, webcasts and webinars. Along with her MS and BSN in nursing, she has 3 other undergraduate degrees and multiple nursing certifications. She served as a US Naval Officer for 10 years, leaving service as an LCDR (Lieutenant Commander) in 2001. Prior to nursing, she worked as a counselor with the mentally ill and dangerous in a facility in southern Minnesota. She returned to that facility as a Lead Psychiatric Nurse for two years after leaving the military. Additionally, Cyndi has a legal nurse consulting business and continues to serve as a testifying expert in medical related cases. 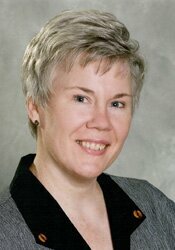 Cyndi's teaching style is dynamic and high energy while informal and easy to understand. You will leave her program with a renewed commitment to achieving nursing excellence in critical care. Financial: Cyndi Zarbano is the owner of Clinical Review Consultants. She receives a speaking honorarium from PESI, Inc. Non-financial: Cyndi Zarbano has no relevant non-financial relationship to disclose. Continuing education credit information is coming soon for this non-interactive self-study package. CEs may be available for select professions, as listed in the target audience. Hours will be dependent on the actual recording time. Please check with your state licensing board or organization for specific requirements. There may be an additional fee for CE certificates. Please contact our Customer Service at 1-800-844-8260 for more details. Nurses completing these self-study materials will earn 14.2 contact hours. Expires: 10/31/2021. California Nurses: PESI, Inc. is a provider approved by the California Board of Registered Nursing, Provider #:17118 for 14.0 self-study contact hours. Florida Nurses: PESI, Inc. is an approved provider by the Florida Board of Nursing. Provider #: FBN2858. These materials qualify for 14.0 self-study contact hours. Iowa Nurses: PESI, Inc. is an approved provider by the Iowa Board of Nursing. Provider #: 346. Nurses successfully completing these self-study materials will earn 14.2 self-study contact hours. IOWA NURSES ONLY: PESI must have your license number on file in order for your hours to be valid. While completing the online post-test/evaluation, please answer YES to the question: “Are you an Iowa Nurse?" and include your license number. After completing and passing the online post-test/evaluation, your information will automatically be sent to cepesi@pesi.com to be filed. If you forget to answer yes, please send an email to cepesi@pesi.com with the following information: full title of the activity, speaker name, date of live broadcast, date you completed the post-test, and your name and your license number. This self-study activity qualifies for 14.25 clock hours of instructional content as required by many national, state and local licensing boards and professional organizations. Retain your certificate of completion and contact your board or organization for specific filing requirements.